As we age, the skin under our eyes becomes thinner and more delicate, allowing the blue veins beneath it to show through as dark, shadowy circles. Lack of sleep, stress, and long hours in front of computer and television screens also contribute to dark circles. But there’s no need to spend money on expensive commercial creams when you can erase dark circles once and for all using do-it-yourself remedies for dark under-eye circles! 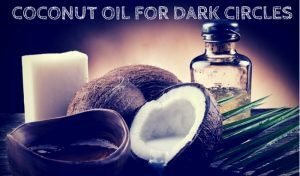 We’re about to tell you exactly how, but first take a look at the properties that make coconut oil such an effective treatment for dark under-eye circles. Coconut oil moisturizes the skin around eyes to prevent dryness and wrinkling. It penetrate quickly into the skin and rejuvenates. It contains vitamins and fatty acids that are essential to the growth of healthy skin cells. The vitamin E and anti-oxidants in it heal and repair damaged skin cells. It is anti-inflammatory, so it reduces redness and swelling. The lactic acid in it tightens pores to make skin smooth and firm. Wash face with mild cleanser and warm water and pat dry. Apply extra virgin coconut oil on clean under-eye skin before going to bed. Massage very gently in clock wise and anti – clock wise directions for few minutes. Repeat nightly at least a week to notice the difference. Potato contains natural bleaching agents, and cucumber tightens pores to keep skin firm and smooth. Peel and chop a cucumber and a potato. In blender, mix cucumber and potato until smooth. Use fingertips to apply on clean under-eye skin, massaging very gently in circular motions. Use fingertips to gently massage coconut oil into under-eye skin. In the morning rinse with cool water and pat dry. Repeat nightly for at least 2 weeks to observe the change. Then follow the process alternate days for a week. Almond oil nourishes and moisturizes skin to keep it firm and smooth. Mix equal amounts of coconut and almond oil. Use fingertips to gently massage on clean under-eye skin. In the morning, rinse with cool water and pat dry. Repeat nightly to get rid of dark circles. Mix coconut oil with few drops of essential oils like grapeseed, sandalwood, or macadamia oil. Use fingertips to gently massage on clean under-eye skin, rubbing in circular motions. Leave on until oil is completely absorbed. This process soothes the skin by stimulating the blood flow and moistures the dry skin. Mix ½ teaspoon of coconut oil with ½ teaspoon of turmeric powder. Use fingertips to apply to dark circles. In a blender, mix 1 teaspoon each of warm coconut oil, honey, whole milk, and lemon juice. Add 2 teaspoons of turmeric and 2 tablespoons of chickpea flour and blend on high until smooth. Apply on clean under-eye skin, massaging very gently in circular motions. For best results, follow the advice below when using coconut oil to reduce the appearance of dark under-eye circles. Always use organic extra virgin coconut oil. Avoid getting coconut oil in your eyes during application. Before starting regular coconut oil treatments, do a patch test to find out if you’re allergic to it. Coconut milk can also used instead of coconut oil. Apply on dark circles and massage for few minutes. If dark circles do not begin to fade after a week, consult a doctor as they may indicate a more serious underlying health problem. Get regular exercise, eat a healthy diet, drink plenty of water, and get plenty of sleep. Have you tried using coconut oil to reduce the appearance of dark under-eye circles? Which methods worked best for you? Share your experience with us! Try any method as per your convenience. Apart from that don’t rub the skin under the eyes and drink plenty of water to keep your skin hydrated and supple. You can apply it on upper eye as well but make sure the application doesn’t enter your eyes. Unfortunately, if it happens then wash your eyes immediately with water. Yes, you can but make sure the mixture doesn’t get into your eyes. Unfortunately, if it happens, rinse your eyes immediately. can you use the coconut oil you made your self to treat dark circle or eye bag? can you also use coconut oil and honey together? Yes, you can use homemade coconut oil for treating eye bags and dark circles. You can use the coconut oil – honey mixture to treat dark circles. Apply the mixture and leave it on for 15 minutes. Rinse off with water and pat dry. Repeat 3 – 4 times in a week. Can i use coconut oil and lemon juice for dark circle…??? Can I use parachute coconut oil for dark circles? No, you should not. It doesn’t contain 100% pure virgin coconut oil. It contains preservatives and chemicals. Can you use solidfied coconut oil for eye bags? Yes, you can. Once the coconut oil (solid state) is applied to the skin, it automatically melts down and is absorbed by the skin. Can I use Shalimar coconut oil for remove dark circle? And tell me some extra virgin coconut oil name. We are unsure about the ingredients present in Shalimar coconut oil. So, check the ingredients list present on the product. If it says organic and cold compressed then you can use it. Can virgin coconut oil be used for treating under eye puffiness? Can i use the mixture of coconut oil, aloevera, glycerin and petroleum jelly. And how many days it can be store? Yes, you can use and can store it for 1 – 2 weeks. can we use patanjali coconut oil under my eyes? Yes, you can just apply coconut oil on the dark circles and leave it on overnight. Rinse off the application with lukewarm water and pat dry. Can i get rid of thin skin under eye with coconut oil ? As per your comment, we are confused of what exactly you are asking? Can you explain us in detail? can i use normal coconut oil not extra virgin coconut oil? Yes, you can but extra virgin coconut oil provides more effective results. Can coconut oil help in reducing fine lines under eyes???? Also can I mix coconut oil and aleo vera overnight??? Yes, the monounsaturated fatty acids present in coconut oil reduce the appearance of fine lines and wrinkles under the eyes. You can apply the mixture of coconut oil – aloe vera and leave it overnight. I’ve been using coconut oil on my face and under my eyes but my eyelids are getting very oil and it feels like the coconut oil may be traveling into my eyes because things get blurry as the day goes on. Is this just for nighttime and, if so, what should I use during the day? Applying more than required might be the reason for the discomforts you are facing. Reduce the amount of application you are using. If you are facing the same even after this, then wipe off the excess oil after 15 – 20 mins of application. Apply it before going to bed. In the morning, you can apply aloe vera gel to avoid discomforts. You can combine 1 teaspoon of coconut oil and 2 drops each of lavender and rosehip oil. Apply enough amounts of the mixture around the eyes and let it on for few hours. But make sure the mixture doesn’t get into the eyes. How often should i use this mixture to get the result? Can I apply the mixture in the night before sleep and wash it off in the morning. Can I use extra virgin olive oil and few drops of rosehip oil for dark circles. Yes, you can. However make sure the mixture doesn’t get into your eyes. Can I use mixture coconut oil ,Rose hip seed oil , lavender oil and witch hazel oil for dark circles??? Can I use coconut oil with garlic to remove puffy eyes? Nope, application of garlic can be harsh on the sensitive skin under the eyes. So, we recommend to avoid garlic for treating puffy eyes. You can just apply coconut oil to remove the puffiness. which method would you recommend for hollow/sunken eyes? would coconut oil and rosehip seed oil be a good combination? Yes, the combination of coconut oil and rosehip seed oil is helpful for sunken eyes. So, try it regularly and share your experience. I just started using coconut oil and I am using Golden Barrel, is that any good? Can I massage Guinness Stout with coconut oil under my eyes? Though my skin tone is fair these dark circles steal it .Dermalmd helps me a lot to get my skin back.